The Department of Homeland Security’s plans to occupy an old psychiatric hospital in the Washington D.C. area have slowly been moving forward, despite the project’s enormous projected cost. The mammoth governmental entity, which has come to umbrella the offices of the Customs and Border Protection agency, Immigration, Customs and Enforcement, FEMA, the abhorrent TSA, and even the U.S. Coast Guard since its creation in 2002, is working to consolidate all of its agencies within one campus at a cost of $4.5 billion. Little-reported, however, is the facility’s history of being used by the CIA (then known as the OSS) to carry out mind-altering and brainwashing experimentation on unwitting mental patients, a clandestine program better known as MKUltra. 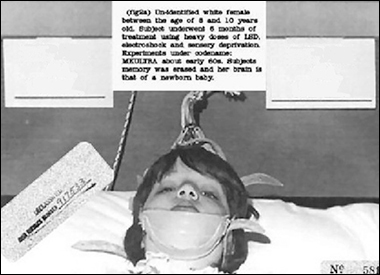 The primary goals of the MKUltra experiments were to test the effects of drugs, namely hallucinogens, and other forms of psychotherapy – including electroshock therapy – on humans, and to research and perfect methods of torture which could best be used to create Manchurian candidates, or mind-controlled persons, who could be programmed to carry out any number of harmful acts, up to and including assassinating presidents of the United States. The new DHS headquarters, St. Elizabeths Hospital, was one of these institutions. “Adm. Stansfield Turner, the Director of Central Intelligence [from March 9, 1977 – January 20, 1981 under presidents Jimmy Carter], testified today that the C.I.A. had secretly supported human behavior control research at 80 institutions,” Nicholas M. Horrock wrote for the Times. “Admiral Turner acknowledged under questioning that the C.I.A. had apparently planned to test drugs on terminal cancer patients at the same institution where it secretly contributed $375,000 toward the construction of…” Georgetown University Medical School in Washington D.C., the Times uncovered. In a report entitled, “British psychiatry: from eugenics to assassination,” historian and investigative journalist Anton Chaitkin says, starting in 1943, facilities at St. Elizabeths Hospital were used to carry out projects under the auspices of the “truth drug” committee for the Office of Strategic Services, the CIA’s predecessor agency. The superintendent and chief psychiatrist, Winfred Overholser, administered “hallucinogen mescaline to various test subjects,” Chaitkin divulges – the same type of “research” Nazi doctors were conducting on inmates of the Dachau and Auschwitz concentration camps. Researchers at the online library Erowid.org say Dominic Streatfeild’s 2008 book, “Brainwash: The Secret History of Mind Control,” revealed that the OSS also tested a mescaline and scopolamine cocktail as a truth drug on at least two volunteers at St. Elizabeths Hospital. 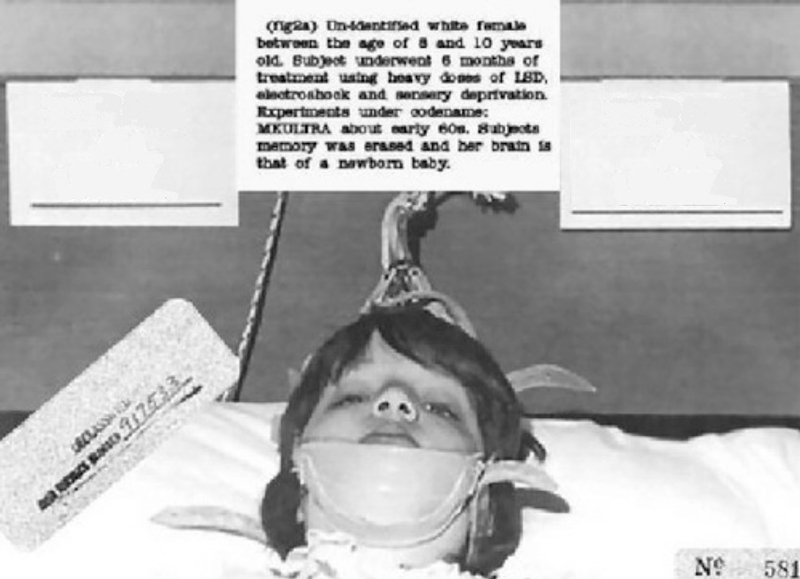 Image depicts underage white female between ages of 8 and 10 who underwent MKUltra research, including treatment using heavy doses of LSD, electroshock therapy and sensory deprivation. Click to enlarge. Records regarding the secretive MKUltra experimentation have all but since been destroyed. “In 1973… then-DCI [Director of Central Intelligence] Richard Helms ordered the destruction of all documents associated with the MKULTRA program…” a brief summary appearing on the CIA.gov website describing a book entitled, “The Official C.I.A. Manual of Trickery and Deception,” states. 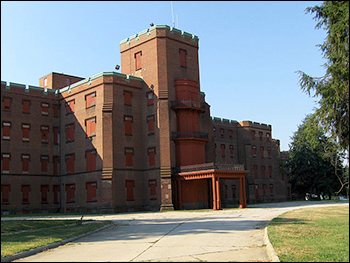 Given the St. Elizabeths Hospital’s notoriety for being used as one of the facilities to carry out covert government experimentation (using tax-payer dollars) and nefarious research into mind-control, it’s no surprise the DHS has chosen the lair as their next outpost – which will be used to scheme further ways to control the public and subvert the United States’ Constitution.